The Madison-based artist's work is on display through March 3 at the Overture Center. Paint does a lot of running and dripping in Madison-based artist Angelica Contreras' latest works, on display through What We Inherit: Remnants Of Light and Space, a joint exhibition with Ellen Reynolds Hall that runs through March 3 at the Overture Center's first-floor gallery. 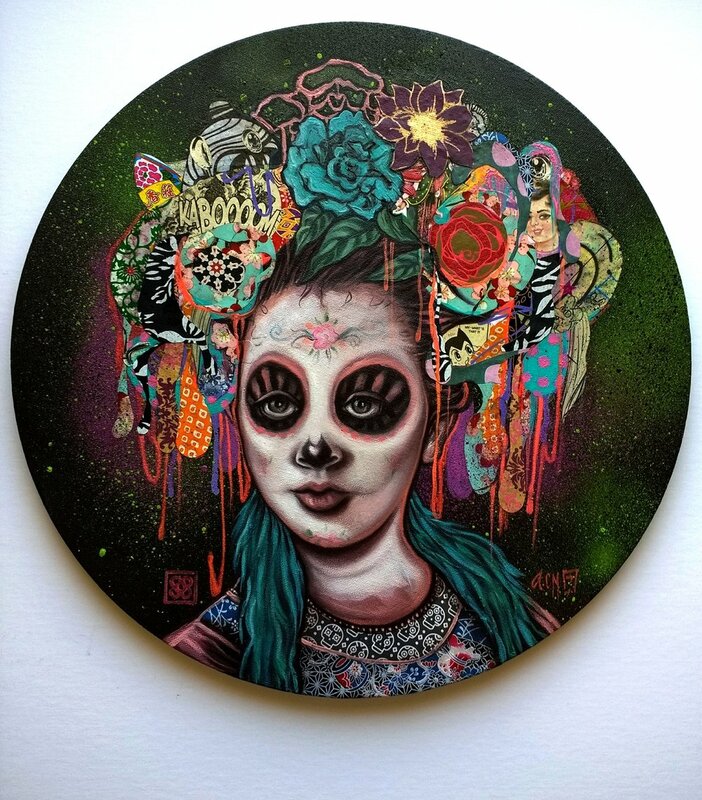 In "Máscara" and in particular the stunning "Maja," unruly drizzles of color form elements of headdresses and elaborate hairdos. Look a little closer at "Maja" and you'll see a comic-book "KABOOM" nestled within a riot of flowers. In "Tehuana," Contreras works in Spanish-language comics panels, a doily, and a small portrait of Frida Kahlo, whose influence looms large in this body of work. The paint streaks make an intentional reference to street art, as does the overall approach of these mixed-media pieces, where styles and cultures literally pile up on top of one another. "This summer I was in Barcelona. I'm into this whole street-art thing, and in Barcelona it's everywhere you go," Contreras says. "All of the doors are completely filled with street art, and they've been wheatpasted and there are stickers and just layers and layers and layers of stuff. They do respect when an artist has their piece and if they're famous they won't touch it. But once one person doesn't know who that is, they'll just start painting over it so it's just layers of art that you see, which I found very interesting." Imagine that you slashed through a particularly well-used street-art surface and fusing the result with stately portraiture, and you have some sense of these latest works, though that doesn't quite do justice to their energy and complexity. Contreras' habit of mixing textures and reference points first took root in her childhood home in Guadalajara, Mexico, which her father would decorate with garage-sale finds, from stamps to Chinese and African art. On top of that, kids in Mexico soak up a lot of manga and anime, Contreras explains. 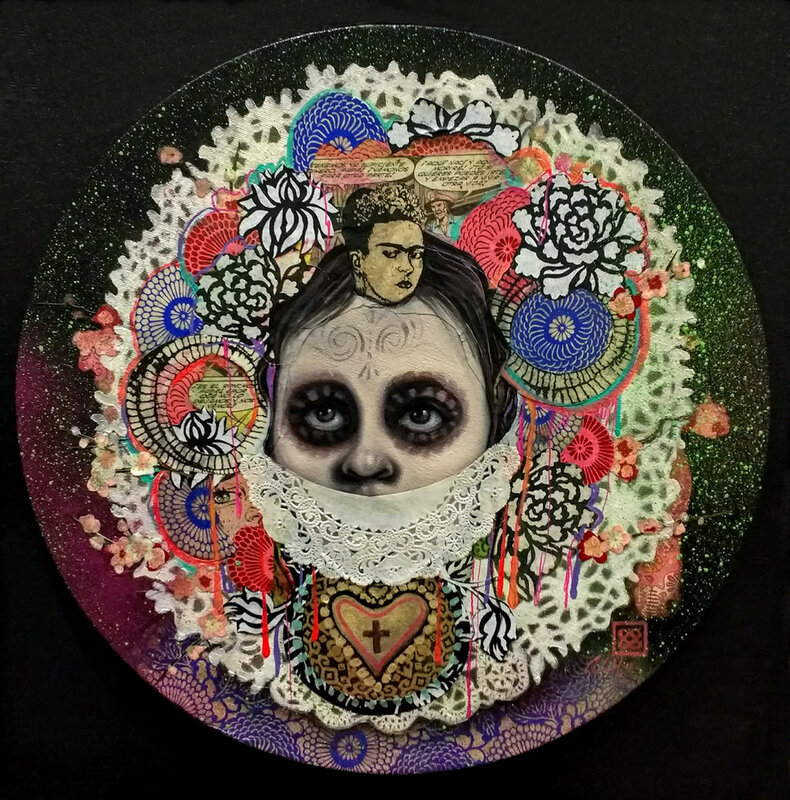 Still, Mexican culture and imagery come powerfully to the fore in paintings like "Maja" and "Tehuana," each depicting a single figure in skull-like Dia De Los Muertos makeup. "These are the most Mexican things I've ever done, and I think it's because I'm away from Mexico," Contreras says. "You start questioning your own identity in a way." The Overture show also includes some earlier works from Contreras, part of a series that experimented with fairy-tale imagery of children and used pastel colors to strangely dark effect. The most memorable of these is "Moruza," which depicts a girl who has wafers for legs and appears to be eating a chunk of one. It's not clear if Contreras set out to make a direct reference here, but when we talk about the painting she explains that she had the impact of diabetes on Mexican-Americans on her mind. In its macabre way, the painting evokes the amputations that sometimes result from diabetes, including in Contreras' own family. Contreras also has a way with gallows humor, though that comes through more clearly in the work she's done off the canvas. The "knick-knacks" section of her website includes scary gingerbread houses and a headboard decorated with a monster face. Contreras also made a ramen bowl whose bottom is a face that appears to be slurping away your noodles from below. As she looks ahead to her next batch of paintings, Contreras is getting more involved in public art. She collaborated with seven other artists to create a mural for Slow Food UW's dining room on campus. She's currently planning a commissioned work for Madison College's south-side campus and made an atmospheric, characteristically layered contribution to the Bucky on Parade project, “Goodnight Bucky.” During the three years she's spent settling into Madison, Contreras has also been noticing a lot of old barns on the outskirts of the city, and has been taking photos of them to inform future works. "I start to see faces in them," she says, hinting at the unlikely combinations to come.